SciLor's QuickTap is a simple "Click-on-the-shiny-button Game". 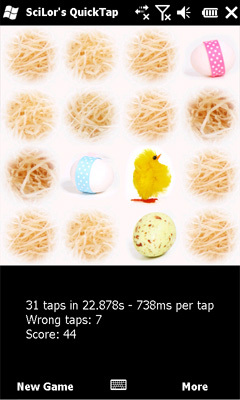 Now with skins and highscore Please use your fingers for playing this (Optimal for the HTC HD2). Using your stylus may dangerous! I am not responsable for any damage! SciLor, I hate to have to apologize, but in this case I do. I was trying to download with my mobile phone and the download site isn't set up for that. When I got back to my desktop, I downloaded two of your programs (QuickTap and Tic Tac Toe) and am quite happy with them. Sorry dude, I should have put my brain in gear before writing. It used to be you could click on download and actually download to your device. Now,it seems, you get redirected to a pay to download site. No matter how often you click on "free download",you just circle back to the site. Who pays for alpha state games? Alpha implies buggy and unfinished. This site has become a shadow of what it used to be. @Wendy, which error you get? Did you tried the zip version?